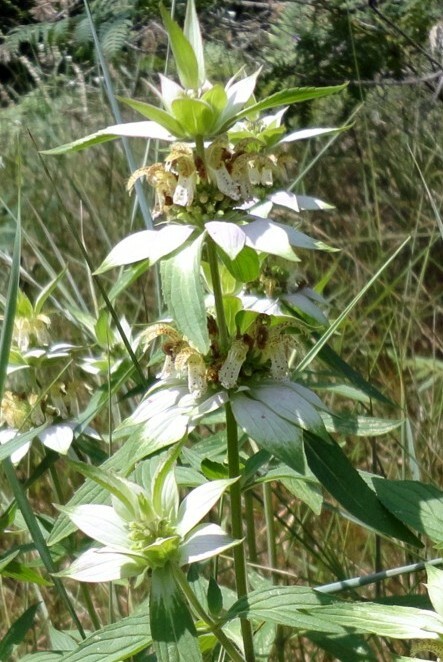 Bee-balm, horsemint, or botanically speaking, Monarda, is an exclusively North American plant containing about sixteen species. As part of the Laminaceae (mint) family, the plants bear both the square stems and the heavily scented leaves common among mints. I’ve tried growing the colorful species M. didyma whose cultivars are sold as garden plants, yet they don’t do well in my often too dry garden. However, if you have a moist area in your garden that is shaded during the hottest part of the day, this plant might grow very well for you. It is amazing to me that I can’t grow Mondarda without regular watering, but M. fistulosa, better known as wild mint, grows in my field along with M. punctata, or horsemint, which seems to grow in nearly inhabitable dry locations. If you look at different species of Mondarda you will see there are two distinctive stem styles. One has a stem that terminates in a single blossom as in M. didyma and fistulosa. The other type’s stem pierces through several blossoms before ending in a terminal bloom as in M. punctata. 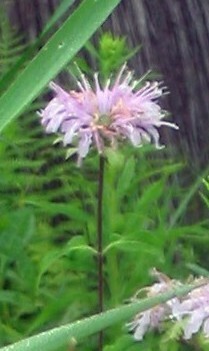 Native Americans and colonists used Monarda as a medicinal plant, for example using M. punctata to cure colic. They also made Oswego tea from the M. fistulosa’s leaves and flowers. I’ve tried it and conclude it is either an acquired taste or the bitter pill for what ails you — while not horrible, certainly an unusual fragrance and taste. According to Edwin Rollin Spencer’s All About Weeds (Dover Publications, 1968, page 218) the Monarda name was given in 1574 by Nicolas Monardes, who never visited the New World, but as a doctor in France, worked on the medicinal properties of these plants. You can search the Internet to find how Mondarda was, and is still, used as a cure for many respiratory complaints. Recipes for tea are available. I do enjoy all the wildflowers that inhabit my property. They create color interest in the wild areas and offer me the challenge of discovering information about them. Of the many problem of a country garden, one of the most difficult is how to successful move from the cultivated landscape into the wild without a sharp distinction. Another problem is researching what is a wildflower from an invasive species, and to encourage the right one. The Internet has made this process increasingly easy. State DNR offices and environmental groups offer other assets. At a recent garden club meeting I received a copy of A Field Identification Guide to Invasive Plants in Michigan’s Natural Communities. I thought I knew a lot, but I was certainly deluding myself. 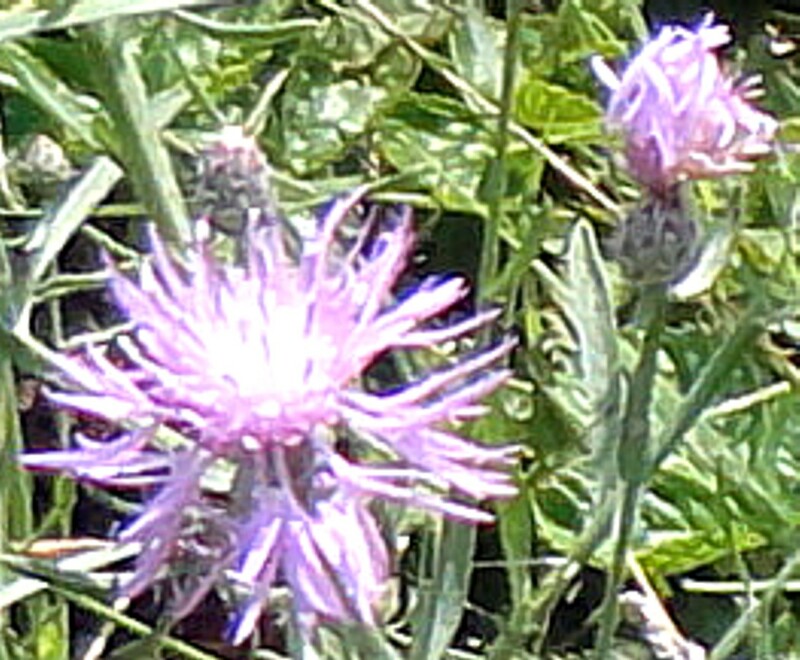 One invasive plant is Centaurea stoebe or spotted knapweed, which could easily be confused with M. fistulosa. That said, wildflowers help make that transition from garden to wild, and in summer and fall Monarda and Solidago (goldenrod) can do a spectacular job at this. In this endeavor I am also introducing other native wildflowers like coneflowers and black-eyed susans into my surrounding field. Since these already grown in my garden, it should help blend garden and wild. Some plants seem to come in and out of favor, becoming old-fashioned only to be rediscovered. One such plant is the Sempervivum tectorum or by its common names either houseleek, or hens and chicks. They used to be present in everyone’s garden and many remain in tribute to their hardiness as their name suggests: semper meaning always and vivum live. The species name tectorum comes from ‘of the roof,’ for they have grown on tile roofs of houses for over 2,000 years in their native regions of southern Europe. It was claimed Zeus gave man houseleeks to protect his home against lighting and fire, and that centuries later Charlemagne in his conviction of that belief, ordered it grown on every roof. Don’t know this for certain, perhaps they’re just legends. Sempervivum are listed in one of my herbals. The leaves have an astringent quality and the inner juice rubbed on irritated skin can relieve burns, insect bites and other itches. Their taste doesn’t recommend them for any culinary purpose, and there is no proven method of preserving them. For many years they have languished, overlooked in neglected garden nooks and crannies while newer more exciting plants took the spotlight. A few years ago they became very popular for use in ‘living wreaths,’ but are more commonly grown in almost any type of container from worn out shoes to elegant urns. Their interest as garden plants rekindled as gardeners sought plants with easy upkeep. Sempervivum certainly provides that, along with a unique form that provides a geometrical dimension and a fine soft blue-green color that makes them a stand out among dozens of leafy mounding type groundcovers. The flat rosettes of overlapping thick, fleshy leaves seem architectural in arrangement, and the abundant offshoots (the chicks) easily root providing many new plants. 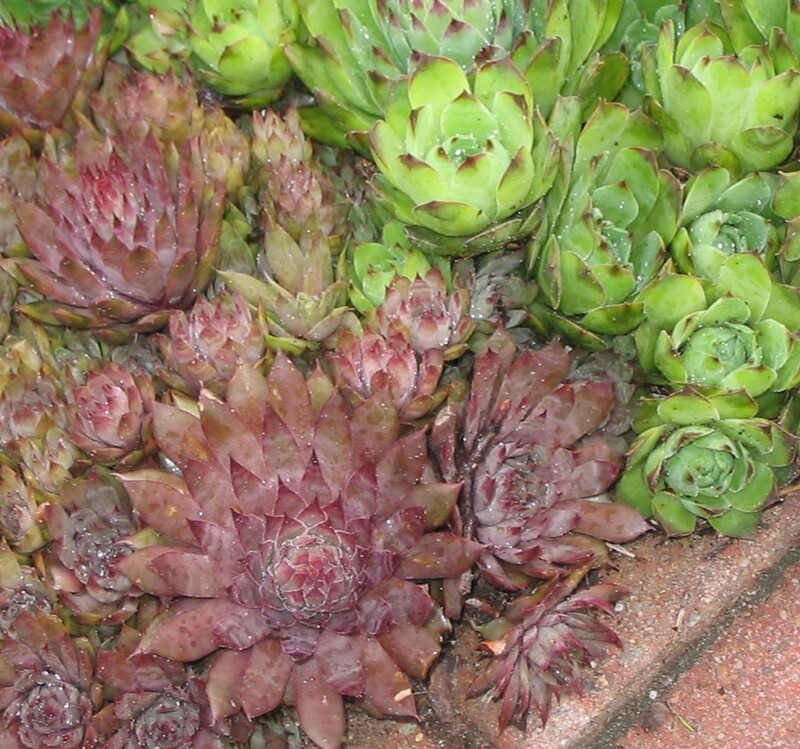 Given time a hens and chicks plant will form a low mat in even extremely difficult garden locations. A relative of Sedum, Sempervivum like fast draining soils, full sun or partial shade, survive drought and neglect, and succeed just about everywhere except boggy soil. These evergreen succulents come from the Alps and Pyrenees mountains in Europe and are hardy to zone four. The flowers are more interesting than beautiful, notable for growing long rope-like stems covered in scale leaves and hold their small flowers in thready, coarse bunches. After flowering the rosette dies, so don’t feel bad about pulling it out and giving the chicks a chance to grow on. Many interesting cultivars are available changing the color spectrum of the plant a little, and more nurseries are carrying Sempervivum, so look for new ones to become available. Other species are not reliably hardy to zone four, but will survive in dish gardens where they can be stored in warmer locations during winter. Sempervivum arachnoideum or the cobweb houseleek is one to try. The plants cover themselves with these beautiful true-blue flowers that last a week or so. They look beautiful under crocus, tulips and daffodils. Looking up information about this veronica, I learned it is a source for ehrenoside, a phenylpropanoid glycoside. Here’s a bit of gleaned information from Wikipedia about phenylpropanoids: Phenylpropanoids are a class of plant-derived organic compounds that are biosynthesized from the amino acid phenylalanine. They have a wide variety of functions, including defense against herbivores, microbial attack, or other sources of injury; as structural components of cell walls; as protection from ultraviolet light; as pigments; and as signaling molecules. So who knows? Veronica pectinata might become one of those herbs important beyond their garden functions and beauty! Wednesday when I left the house, frost remained on the ground and plants. One plant remained green and apparently unaffected by the cold even with frost coating its leaves. 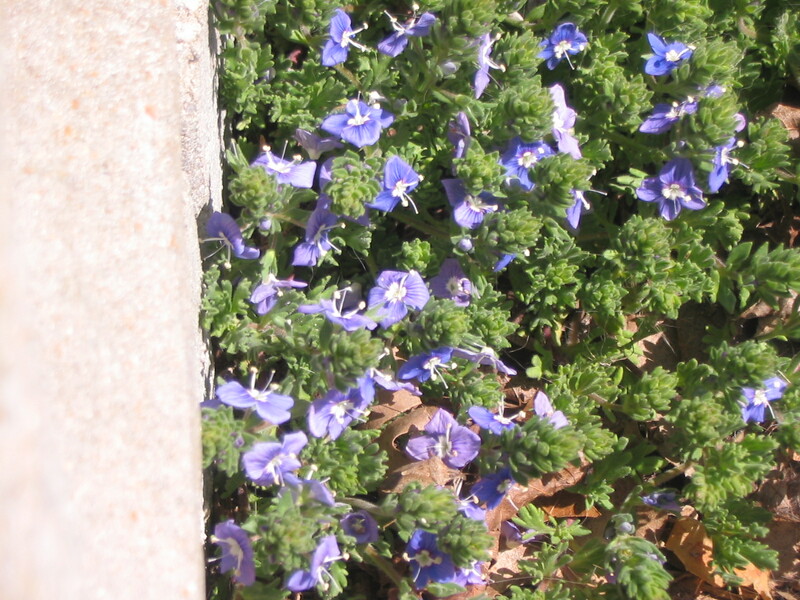 This attractive 2″ tall ground cover is Veronica pectinata, or Blue Woolly Speedwell, a native of the East Balkans in Turkey. I bought it from High Country Gardens three years ago in my search for xeric plants for my garden. My ultimate goal is to have the major portion of my garden water self-sufficient, and this veronica has become a huge asset. In spring it is covered with small blue flowers, and look at how long it retains its beautiful green color! I bought three plants as a trial to see how well they survived under 30″ or more of snow each winter, and planted them in a sunny location. Needless to say in my sand pile, they receive the well-drained soil they prefer. All three are hale and healthy and each has spread very well in its allotted place. Another big plus: deer and rabbits won’t eat them. if you haven’t already, now is the time to walk through the weeds. All types of seed pods are showing their stuff. Yes, they are usually dark brown, tan and otherwise unappealing, but look at their interesting shapes and forms. You can work them into a floral design as is, or spray paint them to the color you desire. I cut these seed pods from my Asclepias tuberosa, or common butterfly weed. While stripping the withered leaves off the stems, I scattered the seeds in my field, so that some might eventually take seed there. Don’t the pods look like little bunny ears? Hmmm… flower show next July with Peter Rabbit theme… perhaps these are just the ‘flowers’ needed. Seed pods from Asclepias tuberosa. Asclepias tuberosa are one of my favorite perennials. While not much to look at during the spring and early summer, they come into their own in July or August with brilliant orange or chrome yellow umbels, and then these wonderful seed pods appear in October and November. They are a native plant, drought tolerant and hardy in my zone 4 garden. A relative of milkweed, they have the same milky sap that identifies the genus. My plants were grown from seed, but they are available from certain nurseries, but don’t try to collect them from the wild. They are tap root plants and seldom survive transplantation. August is almost over, but I still have lots of color in my flower beds. The beds improve every year although I move plants so often, they seldom have time to put down roots. The photo shows one of my favorite plant combinations. The daylily is ‘Fran Hals’ and is a great bloomer that began blooming the last week of July and looks like it will continue until the last week of August. The coneflowers and daylilies have been spectacular this summer, and the Russian sage adds just a touch of soothing blue. I also had Liatris spikes adding a darker purple and lavender to the gardens. There isn’t too much blooming left, but I have a lot of Autumn Joy sedum which will carry September and October. As for our hottest month, it hasn’t been. We’ve had one week of temperatures into the eighties. Very cold night temperatures dropped into the forties several times. My tomatoes may not ripen due to the cold, and even with all the rain we’ve had, my apples are dwarfed. I’m praying for a relatively long and warm September. I’d sure like to can or freeze some tomatoes and make applesauce out of all those tiny apples. After a wet May and a dry June, early July turned cold. Unusual weather. Is that an oxymoron? Doesn’t the weather always seem unusual? One thing I like about the northern garden is that there is always something in bloom. In my Missouri garden it seemed like there was a lull in summer when the garden went green. Which is a good reason, no matter where you garden, to select your foliage with care so that the garden remains visually interesting even when not in bloom. Red lilies and blue cat mint, yellow sundrops, yellow and orange butterflyweed and the old-fashion orange daylilies are blooming in my garden right now. 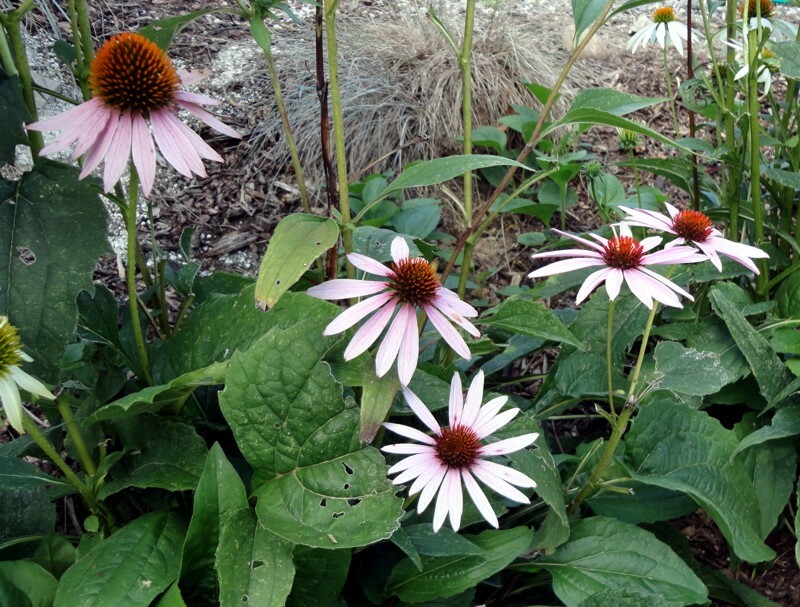 The white and pink coneflowers, hybrid daylilies, shasta daisies and the purple Liatrus are starting to bloom. Early July partial shade garden backing onto pavement. My garden is only four years old, so it is still maturing. It would mature faster if I didn’t move plants so often. However, it is often easier to move young plants to better locations. There are a few reasons to move plants: you find they will work better for the garden next to another plant blooming at the same time, or the foliage juxtaposition is better next to another plant, or the plant isn’t thriving where it was originally planted. Besides, many perennials need dividing every three years, so you’re bound to have empty spaces. On my ledge garden the Stella d’Or is blooming. Mine seems more golden-yellow than the yellow often pictured in catalogs. ‘Happy Returns,’ a relative, is more lemon yellow. They bloom at the same time and as long as seed heads are not allowed to form, continue blooming. Great plants for a long-lasting swath of color impact.